The tsunami, Twitter and the Zones: Did social media amplify government generated confusion? Kitimat, BC and New York City had one thing in common this week, the misuse and use of social media, Twitter and Facebook, that spread both accurate warnings and dangerous misinformation about an impending disaster. In the case of New York and the surrounding area, it was Superstorm Sandy that caused widespread devastation. For Kitimat it was the tsunami warning after the 7.7 earthquake off Haida Gwaii and no damage but a lot of worry for residents. New York has a population of millions, it is the media centre for the United States, and much of the U.S. Northeast coast is still recovering from the horrendous damage from Superstorm Sandy. Kitimat has a population of about 8,000 and my home town is off the media radar except when the Enbridge Northern Gateway pipeline issue pops up on the national assignment desks. If the October 27, 2012 tsunami from the Haida Gwaii earthquake did come up Douglas Channel to Kitimat harbour, it was so minimal that any water rise was scarcely noticed. In one way New York (the state and the city) plus New Jersey and other states were ahead of Kitimat. In the US, there were numerous official sources on Twitter and Facebook, as well as those ubiquitous live TV news conferences with New York Mayor Michael Bloomberg or various state governors. On October 27, neither Kitimat nor the nearby town of Terrace had any official emergency outlets on social media. In Kitimat, that may change as early as this Monday when District Council considers what happened last Saturday night. So in that hour of silence from the BC government, one question that has to be raised is: Were the tsunami warnings so completely uncoordinated–at least as far as the public is concerned– that that was one cause of the misinformation and inaccurate information on Twitter and Facebook? Or did confusing information from authorities simply compound and amplify the social media misinformation that was already spreading across British Columbia and around the world? The most important issue on Saturday night was the false information on both Facebook and Twitter that the Kildala neighbourhood was being evacuated due to the tsunami warning. Other false information on social media indicated that the giant Bechtel work camp at the Rio Tinto Alcan Kitimat Modernization Project was also being evacuated. 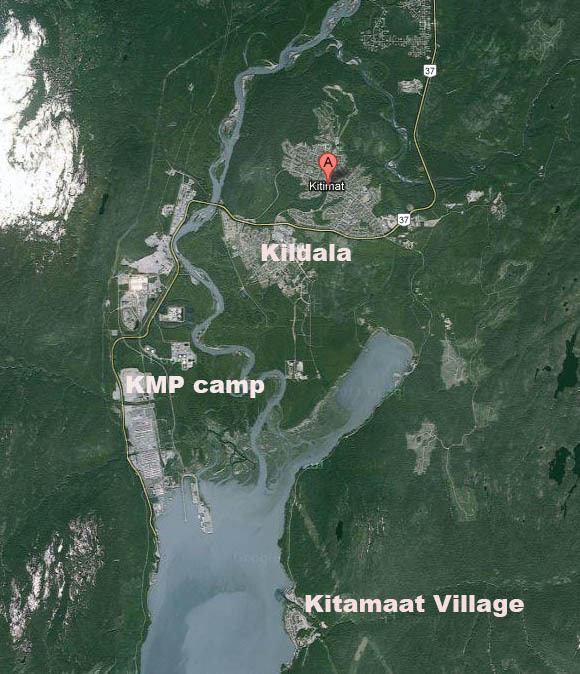 (For those outside Kitimat you can check the town on Google maps) As seen on this screen grab, Kildala is a low lying part of town. The area north of Highway 37 is higher on a hill. Closer to the ocean at Douglas Channel are the Bechtel/RTA Kitimat Modernization Project work camps. Walter McFarlane of the Kitimat Daily recounted his experiences at the post mortem. (We were both at Haisla dinner at Kitamaat Village when the quake struck. 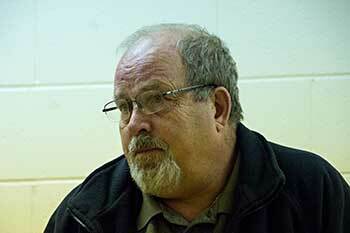 See my earlier story here and McFarlane’s Kitimat Daily story here). After driving from the village to the town, McFarlane told the meeting that he stopped at the town viewpoint where “people were telling me they had already been evacuated out of the Kildala neighbourhood, so my first stop after that was the fire department.” The fire hall is about a couple of blocks from the viewpoint, so it was easy to get accurate information from the fire department. I was about fifteen to twenty minutes behind McFarlane in reaching town. 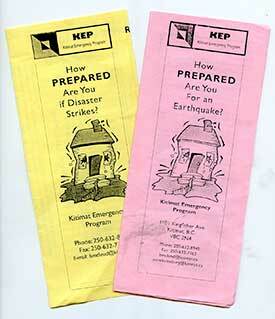 (I did not leave Kitamaat Village until after we heard the first tsunami warning.) As soon as I got to back in cell range, my cell phone started to beep with saved messages from my TV and radio news clients calling for information. When I got to my home office, my landline was still dead and would be for about another twenty minutes. The only source of information at that point was Google News, Facebook and Twitter. I saw the initial, and it turns out general, warning from the Pacific Tsunami Warning Center. Soon I was also getting what I hoped was more specific information on my marine radio from the Canadian Coast Guard Prince Rupert communications station. From the interview on CFTK, it appears that both the Kitimat and Terrace fire departments were also getting inadequate information. “We went to our normal place to look EM BC (Emergency Management BC) and there was nothing there,so we went to Plan B to get information and went on from there,” Bossence told Tyler Noble. In Kitimat, I was told about the man going door to door with inaccurate information and as soon as I confirmed it with reliable official sources, I posted that on both Twitter and Facebook, emphasizing there was, at that time, no evacuation order. I experienced this firsthand during Hurricane Sandy. After retweeting a message warning about muggers in Williamsburg dressed as Con Ed workers as an experiment, I received two sceptical responses checking the claim within 15 minutes, both from people who work in the media industry and spend a significant amount of time on Twitter. Within an hour, I received a mass text message from friends of mine who aren’t completely plugged into the social Web with the same warning: “I just read a news alert of two separate reports of people posing as coned workers, knocking on people’s door and robbing them at gunpoint in Williamsburg. I just want to pass along the info. Stay safe and maybe don’t answer your door.” Two other friends responded with thanks. You can read Keller’s complete article How Truth and Lies Spread on Twitter here. With the earthquake and tsunami warning Saturday night, Twitter misinformation spread internationally. The first hashtag I saw was #bcquake, but as the the tsunami warning gained traction (especially after the warning was extended from BC and Alaska to Washington, Oregon and California and then to Hawaii) the more common hashtag #tsunami became prominent. As people outside BC began tweeting, they began using #Canadaquake and soon #prayforcanada also began to trend. Completely inaccurate information spread on #prayforcanada (believed to have originated in Indonesia) that it was Vancouver, not the north coast that had been hit by the 7.7 magnitude earthquake. At this point, one question has to be asked. The spread of information, first the well-intended but wrong, second just rumour and third, the deliberately misleading, has been seen in social media not only during the earthquake and tsunami on the West Coast last weekend, and during Superstorm Sandy on the East Coast but all the way back to the 2004 Christmas tsunami in Southeast Asia. For the west coast in 2012, however, how much of the problem of misinformation on social media during the earthquake and tsunami warning was the fault of confusing information from the authorities? Just how were people going to interpret such general terms as “north coast” and “low lying areas.”? 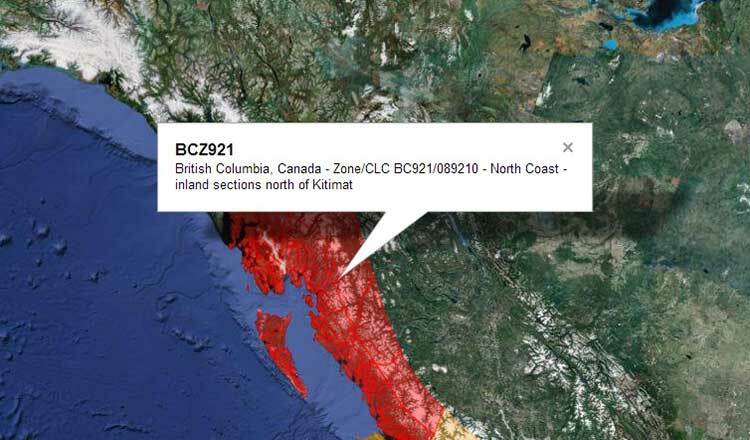 From the BC Provincial Emergency Program you have to ask “What is Zone A?” It turns out by checking a day or so later that the province of British Columbia has created Tsunami Identification Zones. 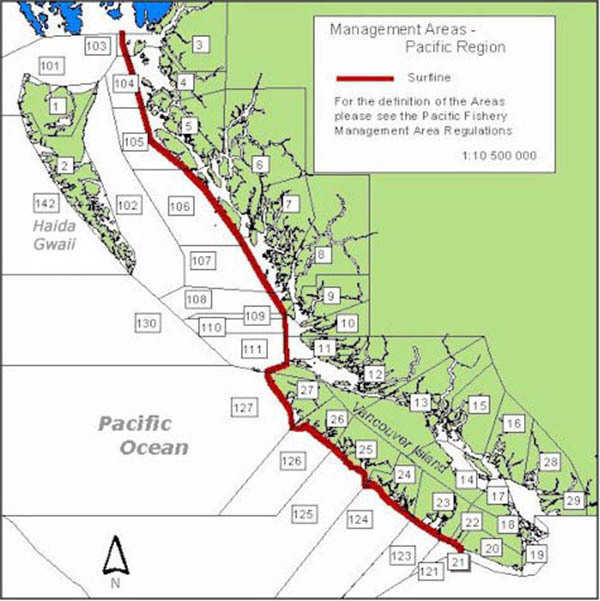 Before October 27, it is likely no one outside of the provincial bureaucracy had ever heard of the provincial tsunami zones. At that time no one in BC, either on Twitter or Facebook or through the media was identifying the BC Tsunami Zones for the public. Later on, the television networks put up maps showing Zones A and B —but that was only good if you had power and were watching the right channel. Kitimat Daily and Terrace Daily posted an official update at 10:42 long after the danger was past explaining the Zone system. It was no good at all if you were listening to news reports on radio or to Prince Rupert Coast Guard Radio on a fishing boat and had no access to the actual maps. Compounding the confusion is that the US system appears to be very different from the Canadian. Adding to the confusion is the fact that the EM British Columbia map shows Terrace, far inland up the Skeena River is considered in Zone A, along with Prince Rupert for tsunami warnings (if a tsunami was big enough to reach Terrace along the Skeena River valley, then I can only assume that much of the west coast of North America would have already been wiped out). McLeod said that after he felt the earthquake, he went online to check information and then went up to the fire hall, which is Kitimat’s emergency coordination centre. There he met Fire Chief Bossence, his deputy, the RCMP detachment commander Staff Sergeant Steve Corp and representatives from Bechtel and the Rio Tinto Alcan modernization project. “For the first little while we were going on line trying to get information. The usual method of dissemination getting information it comes from the West coast and Alaska tsunami warning system, then it goes to Victoria, Victoria gives it to the geophysical specialists and they will confirm or deny what ever the information and then it goes to the Provincial Emergency Program and they shoot it out to coastal communities. “The movie version of a tidal wave is this 50 foot mountain of water roaring along and this is not what is going to happen particularly in Douglas Channel because of the depth. So you are going to see a surge such as we saw in Japan and it will be an increasing surge of water. McLeod then asked the audience, mainly people ranging from their thirties to seventies if they text. Only four or five people put up their hands. “You people are going to be saved, the rest of us…” McLeod quipped. 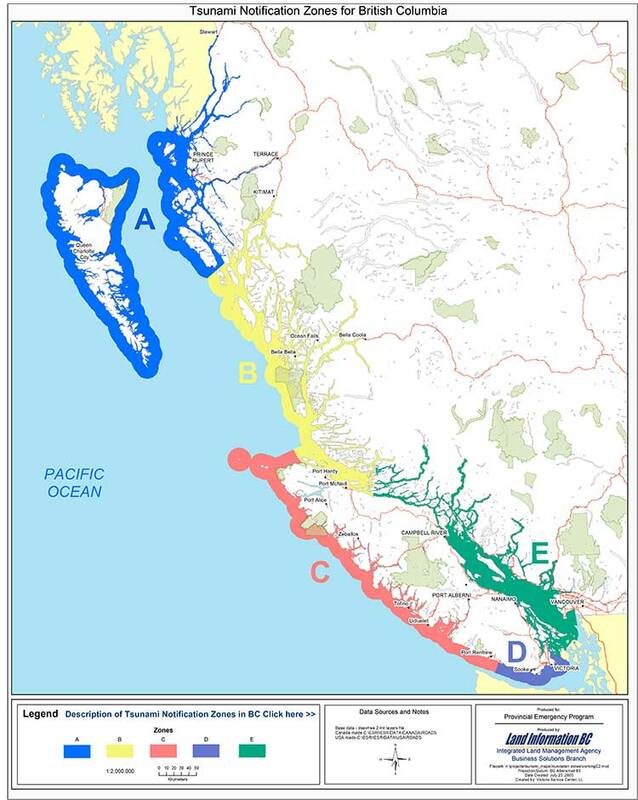 If a conclusion can be drawn from the earthquake and tsunami warning in the Kitimat region on October 27, it’s not just that in an emergency inaccurate, incomplete or malicious information can spread a the speed of light on social media, it’s worse that incomplete, inadequate and confusing information from the authorities is amplified and distorted by rapid posting on social media. That concept is not new for anyone who has tried the phone chain game where the outcome is often completely different from the start. If Gardiner is correct when she says “I know a lot of people, especially on Facebook, who end up believing whatever they see first,” the BC government delays made everything worse. People Tweeted the first thing they saw and the first thing people saw came from multiple and often conflicting sources. Add that to those Tweets that were exaggeration, rumour and lies. The problem in 2012 it is not one person talking to one person talking to one person, it is a Tweet or Facebook posting that go out to thousands, or millions of people and that’s a lot more dangerous. Transcript of Prince Rupert Coast Guard Radio tsunami warning. Pan pan. Pan pan. This is Prince Rupert Coast Guard Radio, Prince Rupert Coast Guard Radio. 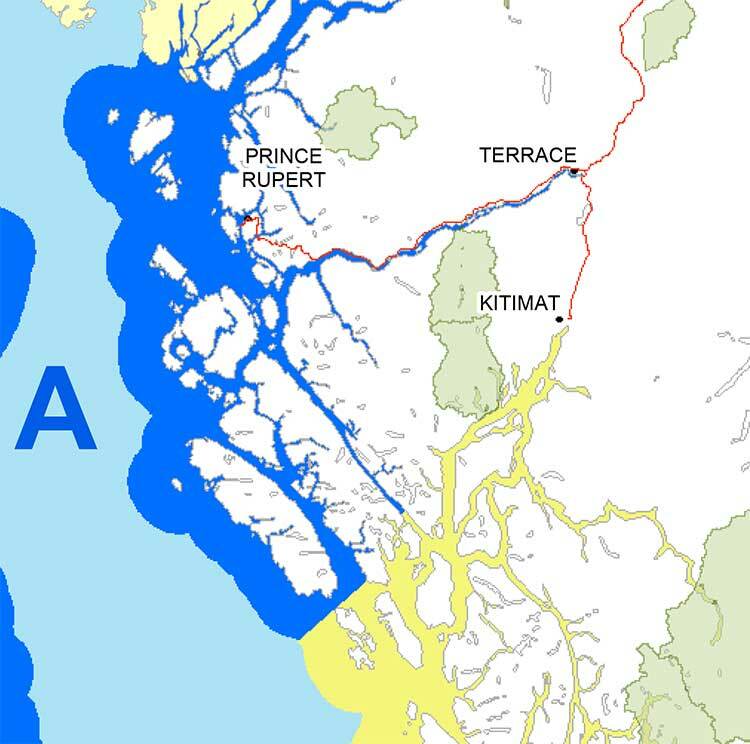 Warning for coastal British Columbia issued by Environment Canada on behalf of the British Columbia Provincial Emergency Program at 2057 Pacific Daylight Time Saturday 27 October. Tsunami warning for Zone A, the north coast and Haida Gwaii,Zone B, the central coast and including Bella Coola, Bella Bella and (unintelligible). A tsunami warning has been issued, if you are in a low-lying area coastal area, you are at risk and must move to higher ground or inland now. Do not return until directed to do so. Closely monitor local radio stations for additional information from local authorities. Please minimize phone use in affected areas, for further information contact the provincial emergency program at website www. papa echo papa period bravo charlie period charlie alpha.Prince Rupert Coast Guard Radio over. ISSUED A REGIONAL WARNING FOR COASTS LOCATED NEAR THE EARTHQUAKE. EXPECT A WIDER THREAT TO OCCUR. SMALL BUILDINGS ARE NOT DESIGNED TO WITHSTAND TSUNAMI IMPACTS. DO NOT STAY IN THESE STRUCTURES. INSTRUCTIONS BROADCAST FROM THEIR LOCAL CIVIL AUTHORITIES. EARTHQUAKES OF THIS SIZE ARE KNOWN TO GENERATE TSUNAMIS. LANGARA ISLAND BRITISH COLUMBIA AT 916 PM PDT ON OCTOBER 27. ALL CLEAR IS GIVEN BY LOCAL CIVIL AUTHORITIES. Did the media over react to the earthquake and tsunami warning? There were also numerous Tweets on October 27, accusing the media of over reacting. The Haida Gwaii quake was 7.7 magnitude. Compare that to the Haiti earthquake on January 12, 2010 which was 7.0. The Christ Church, New Zealand earthquake on February 27, 2011 which caused major damage was 6.3 magnitude. 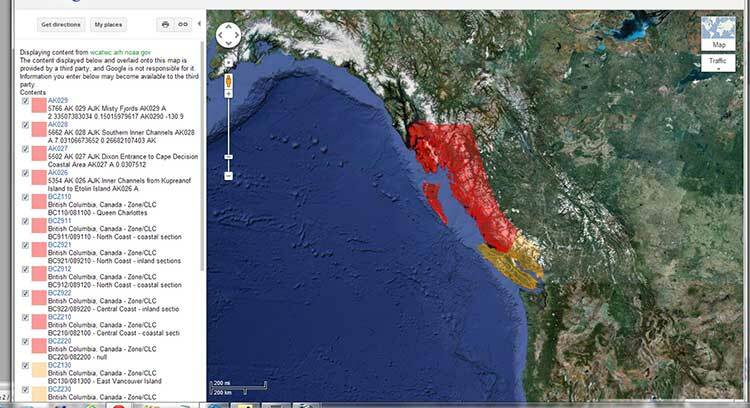 So the Haida Gwaii earthquake was a major event. The tsunami warning that eventually reached as far off as Hawaii had to be taken seriously. Fortunately Haida Gwaii is sparsely populated and there was minimal damage largely because most of the houses and buildings are wood and can absorb some of the shaking from an earthquake. Given the tsunami damage in Southeast Asia in 2004 and in Japan in 2011, no media organization could ignore the developing story.